Is it possible to understand how long someone spent on your email? 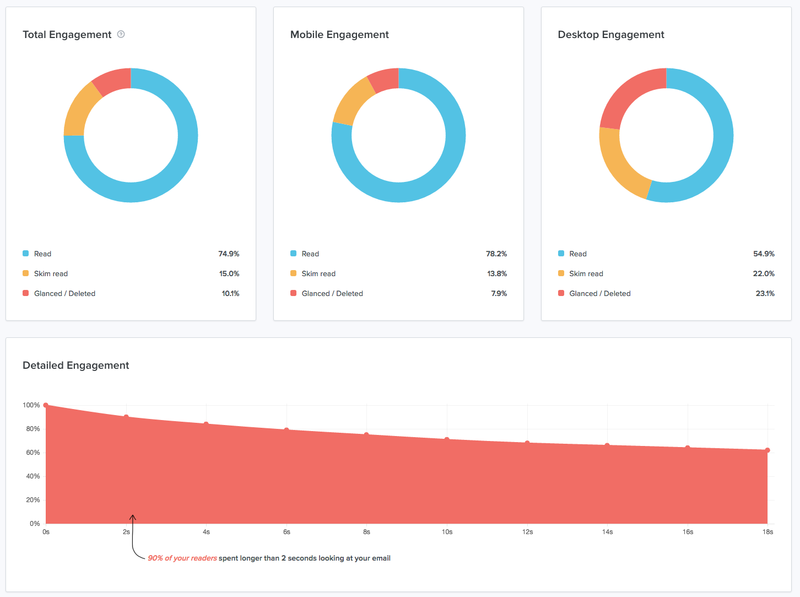 Starting to do some testing to see how engaged people are when they go to articles from the email. However, is it possible to understand how long someone spent reading your email? Testing out long text vs short CTA focused emails. Obviously more people click on the short CTA emails, but I am curious to understand if I can see if someone spends a specific amount of time in the email, then spends more time on the page after they click. However, I know for examples on Apple Mail, whatever the top email is is technically open (I Think). Litmus's analytics will show you this. Oh that is cool. I did not realize Litmus could do that. Do I add in tracking links to my email for Litmus to be able to track this? Yes, plans that are Plus and above (see https://litmus.com/pricing) have access to Email Analytics, which is where the above charts came from. We give you some HTML to paste in your email and we can help you see how engaged your customers are with your email. If you have any other questions feel free to reach out to hello@litmus.com. Cheers!